The Evacuation & Self-Rescue Training course concentrates on the various usages of the SRK-11® (ANSI certified Kit) or SRK-15® (CE certified Kit), for Evacuation and Self-Rescue on structures such as cellular towers, monopoles, broadcast towers, water tanks, silos and rooftops. Each student will learn to inspect and operate the dual-brake descender, as well as adjust the kit to his or her own body-weight in order to keep the kit event-ready in case of an emergency. Each student must have appropriate PPE, including a full body harness, dual leg lanyard and any personal fall protection devices normally used. Students should be prepared to climb an actual structure several times during the day. 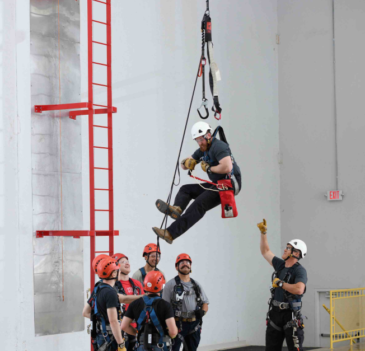 TSL’s rescue training programs meet or exceed OSHA and ANSI standards. We offer a recertification course for those with an expired wallet card. We will work with your company to create customized training and equipment that works best for your company’s specific needs. Receive training on-site worldwide or at one of Tech Safety Lines' training facilities. We provide multilingual training and will work with you to create a custom training curriculum that suits your specific needs. This course concentrates on the various uses and applications of self-rescue and assisted rescue equipment. This training course curriculum is designed to help you and your company establish a safe work environment, safe work practices, and the safe implementation of emergency procedures.